To prevent geometric distortion and ensure an adequate depth of field, the camera should be placed at the subject’s eye level and approximately 4 ft (120 cm) from the subject. By placing the subject on an adjustable height seat, the height of the camera tripod can be fixed. A lens of about 105 mm focal length on a 35 mm film camera, or its equivalent on any other camera, should provide a sufficiently flat field-of-view. 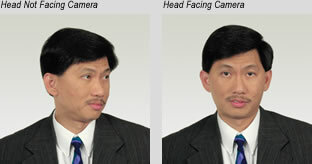 The subject’s eyes should look directly at the camera and the subject may be either smiling or not, but unusual expressions and squinting should be avoided. 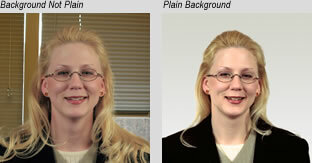 A slight downward tilt of the head will usually eliminate glare on eyeglasses. If this does not reduce the glare, try tilting the head slightly upward or rotating the glasses slightly upward or downward. 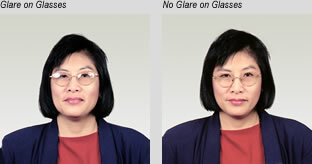 The head should not be tilted by more than a few degrees to eliminate glare. Red Eye conditions should be avoided. Red eye is caused by a direct reflection, through the pupil, from the retina of the eye when an on-camera flash is used, particularly for a subject who has adapted to a darkened environment. Red eye can be reduced by using an off-camera flash or by brightening the ambient lighting. A distracting background should be avoided. Use a plain wall or a photographer’s backdrop cloth as the background. The background color may be white or off-white. Ideally, the background will be out of focus so that minor markings or texture on the background are not apparent in the photo.